Cowboys, Babies, and Shotgun Vows is the best type of Harlequin manga, where the great adaptation manages to make a typical Harlequin story into something really enjoyable. Ryder (hahaha) McCall is fairly full of himself, as he thinks he is “Texas’ No. 1 bachelor.” However his womanizing ways are put to the test when he meets Ashley in a bar. He defends her honor from some creeps and she throws up on him. They end up having a one night stand, and when Ryder wakes up in the morning Ashley is gone. He returns home to work on his family’s ranch, absentminded because he can’t stop thinking of his mystery woman. He learns that Ashley is the daughter of an oil baron who ran away from her wedding, and tracks her down where she’s working in a diner as a waitress to preserve her anonymity. When he realizes that Ashley is pregnant, he decides that he’s going to keep her close until he can win her affections and offers her an accounting job back on his family’s ranch. Hanatsu’s art has a fluid, simple style that really suits this manga well. There are plenty of Harlequin stories that feature lunkheaded heroes, but there’s a warmth and humor to Hanatsu’s illustrations that make Ryder’s abrupt protestations of love amusing and oddly endearing. Hanatsu captures funny family moments as shown when Ryder’s little sister dramatically prays for his success in love clasping her hands under her chin while evoking the specter of girlfriends past and concluding “Please let my stupid brother be happy.” Ryder asks Ashley out on a second date by denying that he is weird and saying “I love you, will you go out with me?” Ryder’s enthusiasm for the possibility of a ready-made family with Ashley, and her understandable reluctance to commit to a man she barely knows forms the bulk of the story, but everything turns out as the reader would expect. 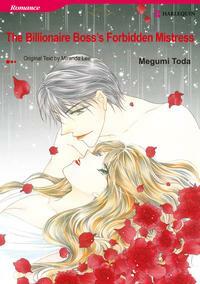 This volume ranked up there as one of my most enjoyable Harlequin reads due to the simplicity and expressiveness of the art, and I’d pick up further Harlequin manga adaptations by Yoshiko Hanatsu without a second thought. This is one case where a somewhat tired plot can’t really be saved by the art. Leah’s father is a powerful stockbroker, but she works as a receptionist for a small cosmetics company. Leah is damaged psychologically by the aftereffects of a car accident that left her with a large scar on her leg and a divorce from a husband who wanted a physically perfect wife. Jason is a corporate raider who recently acquired Leah’s company and he is unscrupulous enough to randomly hit on receptionists, but moral enough not to want to hurt Leah when he learns more about her past. The art on The Billionaire Boss’s Forbidden Mistress is fine for a Harlequin adaptation, but there’s a bit of stiffness here and there with the character’s poses. There are however plenty of starry eyes and flowing hair, which I feel is fairly essential in Harlequin manga. Overall, this was fairly middle of the road for Harlequin manga. The main thing that was missing for me was any element of humor in the story or visual adaptation. If a volume like this is mostly non-stop angst and random misunderstandings that keep the couple apart until the last page, there just isn’t enough dramatic tension to keep me engaged in the story. This volume also probably suffered a bit from being read right after Cowboys, Babies, and Shotgun Vows, because that manga was so much more fun for me to read.